Corporal Desmond T. Doss, the lanky medic, cringed inside. This was not what he had meant when he’d suggested prayer to Lieutenant Goronto. Faced with an assault on the 400-foot sheer cliff that split the island of Okinawa, Doss had merely meant that each soldier might want to spend a few moments in personal, private prayer, before the attack began. It really shouldn’t have surprised anyone in Doss’ company that he would suggest prayer. Doss was always praying…or reading his Bible. From the first day of training, everyone could tell he was different. A devout Seventh-Day Adventist, the first night Doss knelt beside his bunk in the barracks, oblivious to the taunts around him and the boots they threw his way, to spend his time talking to God. Regularly he pulled the small Bible his new wife had given him for a wedding gift and read it as well. Among the men of the unit, disdain turned to resentment. Doss refused to train or work on Saturday, the Lord’s Sabbath. Though he felt no reservation about caring for the medical needs of the men or otherwise helping them on the Sabbath, he refused to violate it. The fact that he worked overtime to make up for it the rest of the week made little difference. Doss was teased, harassed, and ridiculed. And it only got worse. When it came time for the men of Doss’ training company to begin qualifications on weaponry, Doss refused. He had entered the service as a medic, to heal the wounded, not to kill. As a small boy, he had seen a poster showing Cain standing over the body of his dead brother. From that moment on Doss determined that he would never, under any circumstances, take another life. So what do you do with a soldier who won’t train on Saturday, eat meat, or carry a gun or bayonet? Doss’ commanding officer knew what to do. Paperwork was initiated to declare him unstable, a misfit, and wash him out of military service with a Section-8 discharge as “unsuitable for military service.” But Doss wanted to serve his country, he just refused to kill. He performed all of his other duties with dedication, was an exemplary a soldier in every other way. At his hearing, he told the board, “I’d be a very poor Christian if I accepted a discharge implying that I was mentally off because of my religion. I’m sorry, gentlemen, but I can’t accept that kind of a discharge.” So the Army was “stuck” with Desmond Doss. Doss returned to his fellow soldiers and they weren’t any happier to still be stuck with him either. One promised Doss, and not in jest, that when the soldiers faced the inevitable combat with the enemy, “I’ll kill you myself.” Doss didn’t doubt him. That first taste of combat came at Guam, where Doss began to prove his courage in going to any length to treat and care for his fellow soldiers. Then came Leyte. (Years later a missionary in Japan related the story of Doss’ brush with death that day. After the service, a Japanese man in the back of the room told one of the deacons, “That could very well have been me. I was there, and I remember having a soldier in my gun site, but I couldn’t pull the trigger.”) Doss not only survived Leyte, for his repeated heroism he was awarded the Bronze Star Medal. As Corporal Doss stood before the men of Company B at the base of the Maeda Escarpment on Okinawa, they were beginning to believe in the prayers of the medic whose only weapon was his Bible. “Time to go men,” Lieutenant Goronto told his troops. Doss had prayed, finished with his Amen, and the rest would be in the hands of God. The soldiers struggled up the incline, reaching the sheer face that comprised the last fifty feet. Naval cargo nets were used to scale its surface. Upon reaching the summit, Company B was immediately pinned down by heavy enemy fire. To the left, Company A was fighting to scale their sector as well. The first five men were killed and casualties mounted to the point that Company A could proceed no further. Headquarters radioed Company B for a report of their own casualties. So far there had been none. The order was given that Company B would have to take the escarpment themselves. Sweeping across the escarpment the men of Doss’ company engaged the enemy in a fierce struggle, knocking out eight or nine pillboxes. By day’s end, they emerged victorious. Not a single man was killed and the only wounds were sustained by one soldier in Company B whose hand was damaged by a falling rock. It was incredible…even miraculous. It had been almost a month since that “miracle morning” when Doss had prayed and the men of Company B had taken the escarpment. During the period Doss had been busy. The Japanese were not willing to easily relinquish control of their rocky fortress, and many battles had followed the April 29th initial assault. The nature of the escarpment with its caves and tunnels made it possible for the enemy to hide from the Americans who struggled to control the top, then sneak out in the dark of night. Three days after the initial assault Doss had braved a hail of enemy rifle and mortar fire to rush 200 yards forward of the lines to rescue a wounded soldier. Two days later four soldiers who were assaulting an enemy gun emplacement fell. Doss ignored the rain of enemy grenades around him to rush to their aid. Moving to within 8 yards of the mouth of the cave from which the enemy had cut down his fellow soldiers, Doss made 4 separate trips to reach and rescue the wounded. On May 5, 1945, the tide of battle turned against the Americans. Enemy artillery, mortars and machine-gun fire began to rake into the ranks of Company B, 77th Infantry Division. Japanese soldiers swarmed out of their foxholes and caves in every direction. Almost immediately 75 men fell wounded, and the remaining men were forced to fall back and retreat to the base of the escarpment. The only soldiers remaining at the top of the cliff were the wounded, the Japanese, and Desmond T. Doss. Heedless of the shells that burst around him and the bullets directed his way, Doss tended his injured comrades. At the base of the escarpment, those few soldiers who had managed to escape the onslaught could only sit helplessly by and hear the sounds of the battle as the wounded struggled to survive atop the cliff. And then…amazingly…a wounded soldier appeared over the face of the escarpment. Dangling from a rope, he slowly descended to the safety of its base as a tall medic fed the rope through his hands from the summit. First one, then another, and another….and another. Heedless of the advancing Japanese, Desmond Doss went about the work of sending the wounded to safety. Reports of that day tell of Japanese advancing with rifles and bayonets to within a few feet of the medic, slowly lowering his men to safety, before one of the wounded could kill the enemy before they shot Doss. For five hours Doss lowered soldier after soldier down the face of the escarpment, using little more than a tree stump to wind the top edge of the rope around. Throughout the five hours, Doss had only one thought. He prayed, “Lord, help me get one more. Just one more!” How many men Doss saved that day, only God knows. One hundred and fifty-five soldiers went up the escarpment that day, and only 55 were able to retreat without assistance. 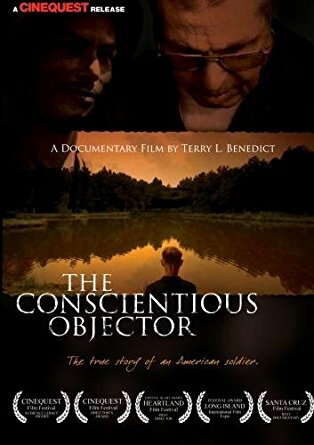 The Army determined the conscious objector who had almost been court martial or discharged as unfit for military service, had saved 100 lives. “Couldn’t be,” Doss had replied. It couldn’t have been more than 50. I wouldn’t have had the time to save 100 men.” In deference to Doss’ humble estimate, when the citation for his Medal of Honor was written, they “split the difference”, crediting the intrepid soldier with saving 75 fellow soldiers. The bloody struggle for the Maeda Escarpment continued for weeks. On the night of May 21st, the Americans launched a bold attack. When the return fire forced the Americans to take cover, Doss remained in the open to treat the wounded. Then he, and three other soldiers, crawled into a hole to wait out the darkness. Suddenly a grenade landed among them. Three men scrambled out but Doss was too late. Reflexively he covered the grenade with his boot, then felt it detonate beneath him and hurl his body into the darkness of night. When he fell back to earth, the leg was still there but bleeding badly from numerous wounds. Rather than call for another medic to leave shelter and risk his own life, Doss bandaged his own wounds and waited the five hours alone until daylight broke. As the litter bearers arrived with the dawn and began to carry the wounded medic out of danger they passed another critically wounded soldier. Doss instructed them to put down his litter, then rolled off it and told them to take the other man. While he awaited their return he was joined by yet another wounded soldier. Together the two of them set out for safety, leaning upon each other. Once again rifle fire split the morning. Pain stabbed Doss’ arm which was curled across the shoulders of his new comrade. The sniper’s bullet went into his wrist, exited through his elbow, and then lodged itself in his upper arm. Had the bullet not hit Doss, it probably would have struck his wounded compatriot in the neck. Doss borrowed his friend’s rifle and used the stock to fashion a splint for his useless arm. Then the two continued to crawl to safety. 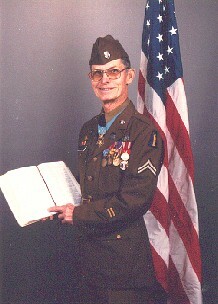 Seventeen pieces of shrapnel were removed from Doss’ leg and his arm set in a sling. On the hospital ship, Doss was being prepared for the return home. Desmond Doss’ war was over. He’d fought a good fight…his own way…without ever compromising his strong beliefs. On October 12, 1945, Desmond Doss was invited to the White House. President Harry S. Truman held a Medal of Honor in his hand as he looked at the brave young medic. 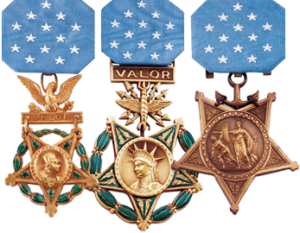 “I would rather have this Medal,” he said, “than to be the President.” Then, with those words, he hung the Medal of Honor around the neck of Corporal Desmond Thomas Doss. At home another surprise awaited the young man. His men hadn’t forgotten the brave medic or his love for the Word of God. The message about “Doss’ Bible” had been delivered. Incredibly, the men who once mocked the Godly Seventh-Day Adventist who would not compromise, had returned to the Maeda Escarpment with a new mission and purpose. After soundly defeating the Japanese they fanned out across the rocky terrain and conducted a search until they found, and mailed home, Doss’ Bible. Doss’ story is now immortalized by the movie “Hacksaw Ridge” released by Lionsgate in 2016. Here’s the trailer. In addition to the flag Doss proudly flies daily from his mountain retreat, a large replica of the Statue of Liberty adorns the front yard. But Doss doesn’t hide away on the Mountain. As he did during his military service, he still seeks every opportunity to share his faith and minister to the needs of others. In 1965 the U.S. Congress voted to provide each living recipient of the Medal of Honor a monthly stipend of $100. Desmond Doss used much of his stipend, as well as his other income, to fund the Civilian Defense Rescue Service for Walker County, Georgia. The following year that new organization met their first test when a group of seven Boy Scouts and their leader became lost in a dark, wet, gas-filled cavern. The new Walker County CDRS worked around the clock to find and rescue them. Doss spent more consecutive hours in that cave, working harder, than anyone else. Doss himself suffered long, lingering after effects of his war service. Tuberculosis in both lungs, probably contracted during his service in the Pacific, left Doss totally disabled and often near death. This lead to hearing problems that were only overcome by a dedicated wife. Despite his own health problems, Doss never quit giving. Throughout his life he has never turned down an opportunity to speak to any group that it was humanly possible for him to attend. Dorothy was always there to help and together, the two felt they could accomplish wonderful things for God’s glory. In 1982 Dorothy was diagnosed with cancer and underwent surgery. For eight years her health improved, then suddenly began to degenerate. Early on the morning of November 17, 1991, as Doss drove her to one of her regular treatments at the hospital below Lookout Mountain, Doss’ car went out of control and plunged over an embankment. Dorothy’s suffering ended that morning. In his time of sorrow, Desmond Doss knew that God was still in control. And God still had work for Desmond Doss to do. After months of struggling with his grief and loneliness, God brought a helpmate to Lookout Mountain. Desmond and Frances Doss were married on July 1, 1993, and continued the work they felt called to perform. In 1998 Frances Doss wrote the story of Desmond Doss’ life in a beautiful 200 page, illustrated book. You can purchase a copy of her book, “Desmond Doss, A Conscientious Objector: The Story of an Unlikely Hero” on Amazon. The story of Desmond Doss was produced as a video documentary and is now available on Amazon.com. Members of the Seventh-Day Adventist churches are encouraged to serve their Country as did Desmond Doss. Doss always disliked the term “conscientious objector” for he did not object to military service, only to the taking of another human life. In the State of Michigan, Seventh-Day Adventist youth train for medical service at a special facility…Camp Desmond T. Doss.